I have a V6 and I just replaced the alternator belt. It was not tight enough after I finished and it squeals like crazy for 1 minute straight after start up. My neighbors love me. How do you guys pry the alternator so it's tight enough?? Also is there any way of doing it without removing the wheel? Seriously, it's the best money you'll ever spend on a V6 Fiero. I would try a 1/2" shorter belt. Just look at the part number for the belt and get a number 1/2" shorter. Example: continental belt from Autozone 4050410 is 41" long and part 4050405 is 40.5" long. It's not so much the length of the belt, as it is the routing. I used Rodney's tensioner and it worked very well for me. 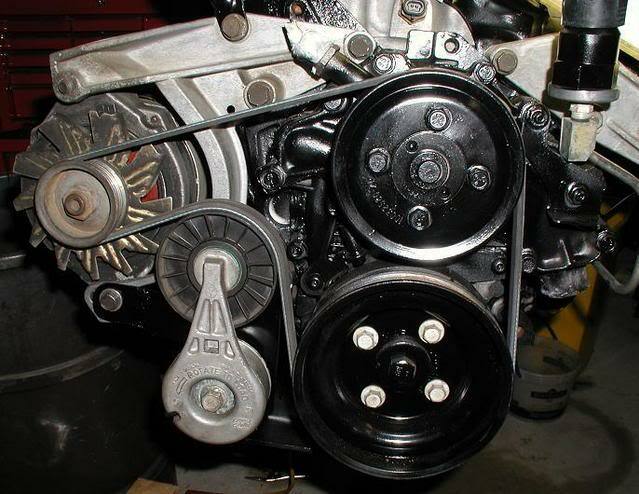 I have heard great things about the dodgerunner set up as well, either is a necessity for the v6 belt system. +1 for dodgerunners tensioner. That's what I am using. If a belt squeals one time, it will probably continue to make noise, because the surface gets cooked and slick. I have had a V6 Fiero for 15 years and not one sound from the belt. Although tensioners are nice, and new belt will be a bit more cost effective. While the tensioner might be the best option in the long run I was more hoping someone could share where they usually pry on the alternator to get it tight enough. It is a brand new belt just not tight enough.. Many times Noise does not = belt is too loose. More so w/ serpent types. Seems like, these days, a majority of the 2.8s do this if you don't have the Rodney or Dodgerunner solution. When I had these cars as a kid, it was a non-issue, and I have wondered why its a problem now with age. Best I can figure, the pulleys get slicker and dirtier with time and use. OP . . . you can use a long bar and leverage to tighten it until it causes pulley failure . . . and it will still squeal, especially when wet. My car has only 11k miles on it, and it would squeal on startup after washing the car. That's with a new alternator and a top-of-the-line belt and lots of elbow grease. The Dodgerunner solution is a nice setup. But for cost and ease of installation, I went the Rodney route. Been good ever since. Just tightened mine. New belt. I keep the bolts near tight before I began. I keep one wrench on a bolt to tighten while using an 18" long 3/8" socket wrench positioned just so. I cannot easily describe where it goes, but it does the job as stated if you get it right. I pull on the socket and tighten the wrenched bolt. I then tighten the remaining bolts with just a slight crank. It fits and I have done it a few times more than most. No tire removal, but I do have the azz end in the air with chocks and stands. Edit: Like stated by earlier good advice, some just do not want to tighten. I have not had an issue with any of my Fieros, but I have read time and time again where this happens and a thread is started. I really like the tensioner idea.